Over the past several months, PG&E has been working on a vital natural gas main that travels through the Bret Harte neighborhood and feeds most of southern Marin County. After the San Bruno pipeline explosion, PG&E thoroughly evaluated gas lines throughout the state and identified this one as one needing replacing. 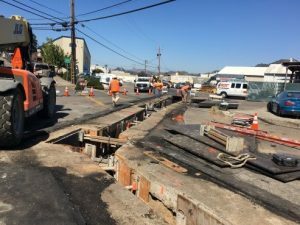 PG&E’s construction has involved excavating, removing and replacing the existing gas main down 2nd Street, Irwin Street, Lindaro Street, Andersen Drive, Woodland Avenue, and onto Du Bois Street. PG&E’s contractor has encountered some significant challenges, including unstable trenches and navigating around other utilities in the area. This work has included thorough testing of the new systems before the trenches are filled, which has required a long section of the roadway to be closed and plated. At Monday night’s meeting, PG&E representatives will be providing an update to the City Council on their progress. For more information, visit PG&E’s website.